Description: This DIY mosaic art kit presents a unique opportunity to create a one of a kind gift or an artwork for your own enjoyment. It is suitable for mosaic lovers of all levels as well as individuals with interest in arts, crafts or puzzles. The Spring is featured through a butterfly and peach flowers. The butterfly symbolizes our soul, endurance, change, hope, and life, while the peach flowers are a symbol of eternal love. 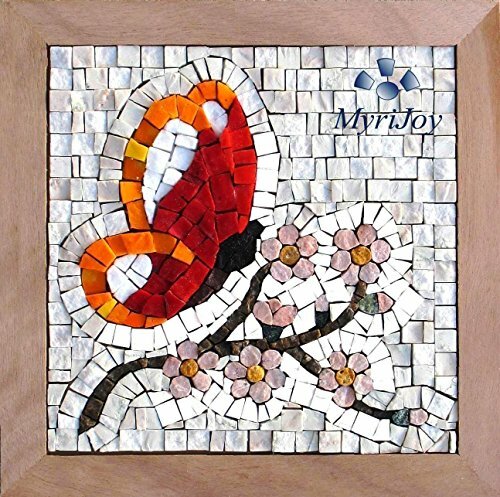 Material:The mosaic art kit includes: selected Italian marble mosaic tiles, Murano-Venice glass tiles, board with printed grid and frame, hook, image of the finished mosaic, instructions. The kit does not include: nippers (to trim the tiles as needed), PVA glue, safety goggles. If you have any questions about this product by MyriJoy, contact us by completing and submitting the form below. If you are looking for a specif part number, please include it with your message.